This tutorial video shows you how to identify and name organic compounds containing a carbon to carbon triple bond. Examples including naming simple alkynes and naming alkynes with substituents using my puzzle piece approach to IUPAC nomenclature. 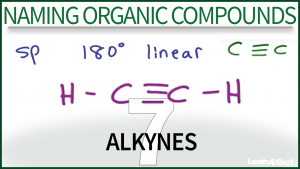 This is Video 7 in the Naming Organic Compounds Video Series. Click HERE for the entire series.